This is the image that (according to Fox news) has necessitated therapy for a child and is emblematic of our society's gender confusion. "Lucky for me I ended up with a boy whose favorite color is pink. Toenail painting is way more fun in neon." So writes Jenna Lyons of the creative director's "Saturday with Jenna" feature, a part of the brand's attempt to inject more personality into the catalog. 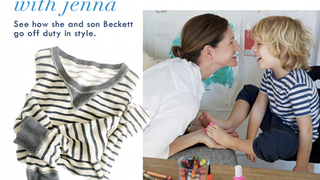 And yes, there she is with her young son Beckett, painting his nails with Essie. (Which, oddly, is labeled "Girls Nail Polish" on the website.) Now, one could argue with the wisdom of featuring your young child in such a public way. One could argue with the wisdom, I suppose, of having to explain the fate of Saint Thomas a Beckett at some point down the line — to say nothing of Crapp's Last Tape. But this is not the concern of Fox News' Dr. Keith Ablow. Writes he, "Yeah, well, it may be fun and games now, Jenna, but at least put some money aside for psychotherapy for the kid-and maybe a little for others who'll be affected by your "innocent" pleasure. This is a dramatic example of the way that our culture is being encouraged to abandon all trappings of gender identity-homogenizing males and females when the outcome of such "psychological sterilization" [my word choice] is not known." In combination with "Media Research Center's Erin Brown", who apparently termed the ad "blatant propaganda celebrating transgendered children," Fox News deemed this "a debate on gender identity." However, even amongst their own ranks, they had a hard time getting people riled up over the tempest in the normative polish bottle. As a reporter reluctantly admits, "When asked if the ad crossed the line, a majority of Fox News Twitter users" said no. Which should really tell you something right there.